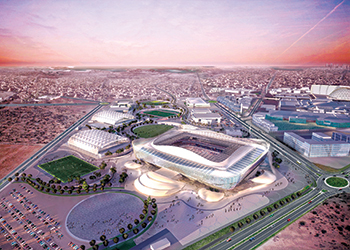 The Al Rayyan Stadium ... an artist’s impression. 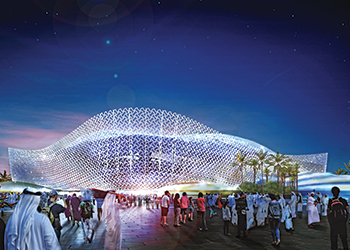 “As part of a joint venture, L&T will serve as a contractor building the 40,000-seat Al Rayyan stadium,” says a Qatari government official. L&T is one of India’s biggest industrial groups and is involved in infrastructure projects in the Gulf including the construction of a metro line in Doha. In May the company’s group executive chairman said L&T was bidding for projects in the Asia and Africa to counter a slowdown in Middle Eastern markets which have been hurt by declining oil prices. Located 20 km west of Doha, Al Rayyan stadium is being built on the site of Al Rayyan Sports Club’s former stadium (Ahmed Bin Ali Stadium), which was demolished to make way for the new venue. The project is expected to be completed in the first quarter of 2019. The stadium will host group stage, round-of-16 and quarter finals matches. In legacy mode, its capacity will be reduced to 21,000, with the upper tier of seats removed and sent to developing nations in need of sports infrastructure. Sustainability is at the heart of the design, beginning with the deconstruction of the old stadium, with 90 per cent of the materials resulting from the demolition being reused. Some of the materials will be used by local and international artists to create works of public art which reflect the history of Al Rayyan Sports Club. It will contain a number of facilities that will be used by the local population of Al Rayyan, including a mosque, members club, athletics track, cricket pitch, tennis courts, hockey pitch, football training pitches, aquatics centre, skate park and cycling track. The precinct will also house a new branch of Aspetar sports medicine hospital.